The surface area of a sphere is 5544 cm2, find its diameter. A hemispherical bowl made of brass has inner diameter 10.5 cm. Find the cost of tin plating it on the inside at the rate of Rs.4 per 100 cm2. The dome of a building is in the form of a hemisphere. Its radius is 63dm. Find the cost of painting it at the rate of Rs.2 per sq m.
Assuming the earth to be a sphere of radius 6370 km, how many square kilometers is the area of the land if three-fourths of the earth’s surface is covered by water? 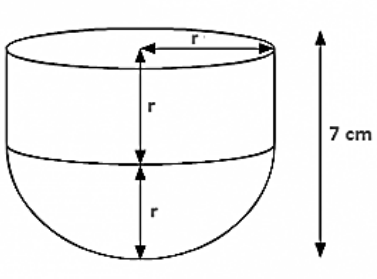 A cylinder of same height and radius is placed on top of a hemisphere. 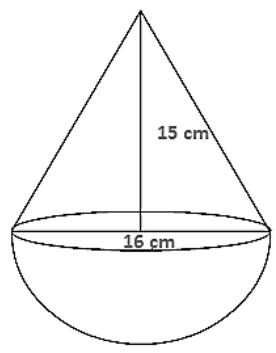 Find the curved surface area of the shape if the length of the shape is 7cm. 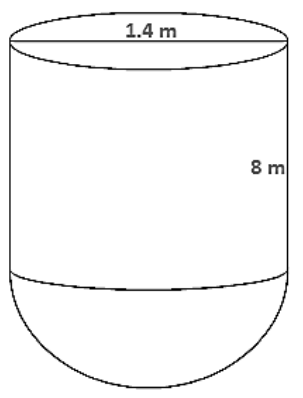 A storage tank consists of a circular cylinder with a hemisphere adjoined on either end. If the external diameter of the cylinder be 1.4 m and its length is 8 m, find the cost of painting it on the outside at the rate of Rs.10 per m2. The diameter of the moon is approximately one-fourth of the diameter of the earth. Find the ratio of their surface areas. Given that only the rounded surface of the dome to be painted, we would need to find the curved surface area of the hemisphere to know the extent of painting that needs to be done. 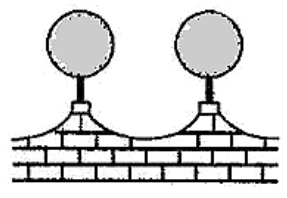 The front compound wall of a house is decorated by wooden spheres of diameter 21 cm, placed on small supports as shown in the figure. Eight such spheres are used for this purpose and are to be painted silver. Each support is a cylinder of radius 1.5 cm and height 7cm and is to be painted black. Find the cost of paint required if silver paint costs 25 paise per cm2.